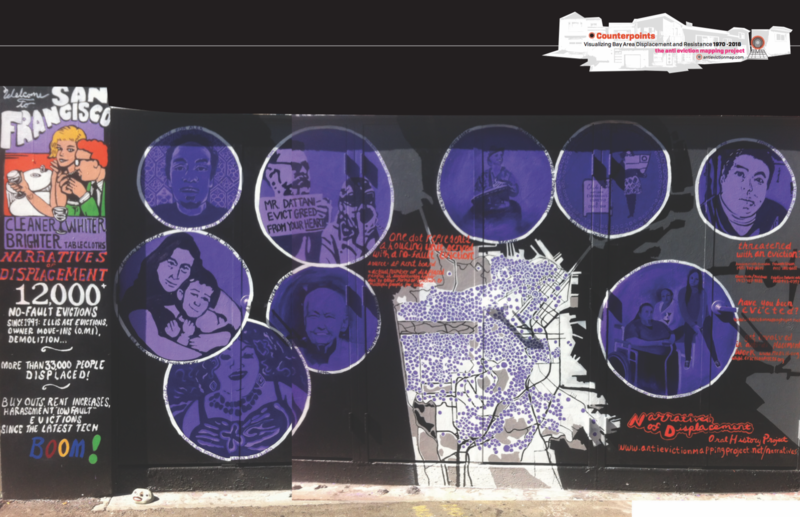 The Anti-Eviction Mapping Project is a data visualization and storytelling collective of scholars, artists and activists fighting for housing justice throughout the Bay Area and beyond. With the support of a GUH Student Publication Grant, AEMP is publishing Counterpoints (PM Press, Spring 2020), an atlas of the Bay Area. Mary Shi, a PhD student in Sociology and one of the atlas editors (among which includes Scott Chilberg, a recent Master in City Planning graduate and recipient of a Graduate Certificate in Global Urban Humanities), writes here about AEMP's approach to community-engaged scholarship and its vision for the atlas. The core mission of the Anti-Eviction Mapping Project is to inform, empower and activate individuals who are negatively impacted by housing inequity and displacement, and to support the work of organizations fighting for housing justice. By excavating pertinent data and producing accessible, powerful visualizations of this abstract information connected with individual stories of struggle, the AEMP reorients and repositions power in the community and in the hands of those who are working to restore housing equity in low-income communities and communities of color. The AEMP is, at its core, a project rooted in the idea of the constitutive power of knowledge and a commitment to entrust that power in the hands of the community. As a collective, the AEMP has always had one foot inside of the academy and the other in its community. Currently, roughly two-thirds of its collective members have affiliations with an institution of higher learning. The desire to produce impactful, community-engaged scholarship was one of the founding motivations of the collective. Essentially, the AEMP asked, "What if we used to tools of the academy to radically empower our local communities?" What if we used the authoritative tools of the university to tell the stories of those who have been told, time and time again, their stories are 'only anecdotal,' 'missing the bigger picture,' or 'uninformed?' What if, instead of looking to our scholarly literature for questions, we looked to our community organizations actively fighting for change on the ground? In the past, AEMP has been highly effective working with community organizations and the neighborhoods and individuals directly affected by displacement to empower those fighting for housing justice. Working alongside the San Francisco Tenants Union, Tenants Together, and other housing organizations including Causa Justa Just Cause, the Eviction Defense Collaborative, and the Anti-Displacement Coalition, AEMP has provided analysis of clinic and rent board data so that housing organizations can rapidly make sense of urban change. Storytelling projects such as the Narratives of Displacement Oral History Project Clarion Alley Mural, and Oakland Community Power Map at the Betti Ono Gallery have also served as powerful, and powerfully public, representations of the experience of displacement in the Bay Area that have helped communities make visible and articulate their collective experience of displacement and organize in resistance. As a collective with one foot in the academy, AEMP has also been active on university campuses around the Bay, deepening the connections between students, scholars, and their communities. AEMP members have served as frequent classroom visitors and panel discussants, and have even served as partners for more long-ranging, classroom collaborations. For example, in the 2016-2017 academic year I served as both the oral history coordinator and community mapping coordinator for two different American Cultures courses. In the first, freshmen were asked to cultivate the capacity for listening closely through oral history trainings, and then paired with interviewees from the AEMP's Narrating Displacement oral history project to learn about displacement first hand. In the second, undergraduates experienced first hand the transformative power of representing data through a map when they were asked to build their own 'community power map' of spaces they felt empowered on Cal campus, while linking their maps with historical narratives pulled from the archives of past student empowerment struggles. In 2017, AEMP decided that it was time for the collective to pull together its years of work into an atlas. However, this atlas was going to more than simply a collection of past projects. Constructing an atlas was also going to be an opportunity to tell parts of the Bay Areas's story that had been overlooked before--that required a more holistic view to tell properly. An atlas would also be an opportunity to share with other scholars a powerful platform for them to tell the stories that they felt needed to be most urgently told, especially when they didn't fit the confines of academic publishing but so obviously met the needs of their communities. And so, Counterpoints was born. On one hand, the atlas is an opportunity for the AEMP to tell a more fully regional, historical, and structural story of the Bay Area than it has ever told before. On the other hand, it is a platform to amplify the work of other scholars working in this space who have not been able to make the full impact of their data known. In January of 2018, AEMP circulated a Call for Papers throughout the Bay Area's universities looking for contributions that would fit the mission of the atlas, including throughout the Global Urban Humanities Initiative's programs and affiliated centers. The Atlas will feature many contributions from UC Berkeley students and alumni, all engaged in critical scholarship of the urban spaces they live in. AEMP collective members have also been meeting on campus throughout the summer to work on the atlas, and will continue to do so in the fall as well as act as community partner to Alicia Cowart's GEOG 183 course, Cartographic Representation. The AEMP is looking forward to further expanding its collaborations on Berkeley campus in the future, and announcing future Atlas-related events and workshops. Those interested in learning more or getting involved should reach out to Mary Shi at mary.shi@berkeley.edu. We asked Padma Maitland to tell us about his experience participating in the Global Urban Humanities Initiative and how it shaped his current academic and professional career. Padma Maitland received the first Global Urban Humanities Student Publications Grant for the Urban Pilgrimage issue of Room One Thousand. 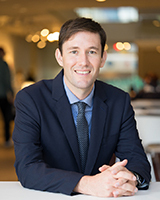 He is currently working on two doctoral degrees at UC Berkeley, one in the Department of Architecture and the other in the Department of South and Southeast Asian Studies. His dissertations focus on modern Buddhist art and architecture, and the intersection of Buddhism and travel in Hindi literature. Prior to his graduate studies at Berkeley, he was the Assistant Art Director of the Swayambhu Renovation Project, where he worked with a team in Nepal to restore the Swayambhunath Temple—popularly known as the Monkey Temple—one of the most iconic temples in the Kathmandu Valley. He was also the Jane Emison Assistant Curator of South and Southeast Asian Art at the Minneapolis Institute of Art, where he organized the exhibition Home and Away featuring a set of Letters by the artist Amar Kanwar. How were you involved with the Global Urban Humanities Initiative (GUH)? I have been involved with the Global Urban Humanities Initiative in a couple of ways. I was the co-recipient of the first student publication grant, working with Lawrence Yang to co-edit a special issue of the journal Room One Thousand on the theme of "Urban Pilgrimage." Our faculty advisors for the project were GUH Faculty Dr. Winnie Wong and Dr. Andrew Shanken. You can access the issue via e-scholarship here or via the journal's website here. After that I served as a member of the GUH student advisory board. Around the time GUH was launched, I was busy working with a small group of students to found the Architecture Department's journal Room One Thousand. Its main objective was to explore the potential intersections of architecture and the humanities and it was great to see how what we were doing aligned, but also differed, from the kinds of projects being developed as part of GUH. More than anything I enjoyed the chance to be part of a campus wide conversation on different approaches to studying cities, as well as the chance to interact with a diverse and engaging group of students and faculty GUH has managed to bring together from across the campus. How did your experience help you with your current research or career? Being a part of GUH allowed me to interact with amazing scholars, artists, intellectuals, and to really benefit from their advice and guidance in my research and other projects. It also showed me the value of creating forums where people from different fields can come together to collaborate and explore new ideas. I have tried to make similar moments part of my research and career. What was your most memorable GUH experience? The best part was always the conversations, but a particularly memorable moment was at a special presentation during one the GUH colloquium (click here for Fall 2018 speaker schedule). The two recipients of the GUH student publication grants were presenting their work. It was great to see how each group approached the project and I remember having so much fun sharing the joys and challenges of putting together a publication. I think the ability to both support and challenge each other is one of the truly amazing aspects of GUH. What is your favorite global city you have traveled to, and why? Varanasi. Famed as one of the oldest continuously inhabited cities in the world, the city presents itself as an almost complete microcosm of India and even the world. The cycles of life and death, joy and suffering, are played out along the shores of the Ganges River. Walking along the ghats, you encounter sadhus, tourists, and pilgrims. Mourners sit besides groups of photographers. School children play cricket next to people washing clothes and burning corpses. If you take a boat ride down the river, you'll likely be invited to place an offering in the sacred waters, adding your wishes to thousands of others who put their trust in the river's power each day. It is also a city of joy and discovery. Every corner or alley seems to have some unexpected story, courtyard, or temple, reflecting a continuous effort to develop the city according to the changing ideals and fashions of the times and all those who have lived and traveled there.